Register and be sure to include the bar code number on the sticker that was affixed to the front of your important information brochure. You will receive an email notification when your results are available. Simply follow the link in the email, and log in using the username and password. Your results will be available online for 6 months. If you have any questions about obtaining your results please contact your insurance company or agent. As individuals, we have different preferences when it comes to viewing information. We designed the web site with that in mind. You can view the results graphically or as a simple list. 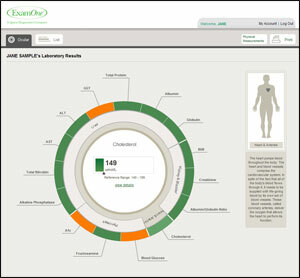 You can also manage your profile information, save as a PDF, print results and share them with your personal physician.